Pat Flood, a football official for more than 30 years, started out officiating at the High School level in the Tucson area in 1962. He gradually worked up through the Junior College and Northern Arizona University officiating ranks to the Western Athletic Conference (1967-1983), and then to the Pacific-10 Conference where he has been a referee since 1984. Pat has officiated many bowl games, including the 1991 Rose Bowl and the 1995 and 1996 (national championship) Fiesta Bowls. He was also the referee for three UA-ASU football games (1987, 1992, and 1994). 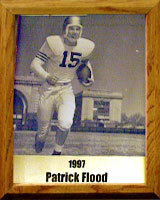 Pat grew up in Tucson and led Tucson High School to back-to-back football championships in 1951 and 1952. He was the All-State First Team Quarterback in 1952, played basketball and baseball for Tucson High and won many awards as a standout swimmer. He attended the University of Notre Dame for one year and then transferred to the U.S. Naval Academy, graduating in 1958. He lettered in football, and swimming at the Naval Academy, earning academic All-American honors in football and playing in the 1958 Cotton Bowl. After serving as a naval officer for four years, Pat attended the University of Arizona Law School, graduating in 1965. He then moved to Phoenix and began practicing law with the Phoenix law firm of Jennings, Strouss & Salmon, where he continues to practice and specialize in fidelity and surety work, construction law, and professional liability law. Pat has been involved in many legal organizations, and also belongs to the Phoenix Thunderbirds and numerous other charitable and civic organizations.